Brands might be looking at PUSH messaging as the holy grail of consumer CRM & dialoging, but it begs the question; how much push is too much? Smartphone consumers find value in getting messages from brands that know just the right way of reaching them with valuable news, information or offers, but is there a secret formula? How and when is the line between dialog & disruption crossed, and how can brand marketers both capitalize on this powerful mobile medium without risking alienation or worse, driving their target market into the arms of a more ‘relationship friendly’ brand? It’s a slippery slope, to be sure. Consumers have new and broad abilities to be discriminating in the PUSH channel that differ from most other mediums. In television, for instance, a consumer can now push a button to zip past a commercial, or even all commercials in a television program. They must, however, do this for each and every commercial they wish to skip, their remotes lacking any button that says ‘skip all commercials’ nor any button reading ‘skip all car commercials’. The PUSH channel, by way of comparison, is precisely the opposite. Not only can a consumer selectively turn the messaging medium on or off at will, they may also do this app to app, allowing one app to PUSH while preventing it from another. To dig into the mindsets of consumers relating to PUSH, once again we’ve invoked the power of our mighty SurveyApp panel to get at some attitudes and opinions related to the PUSH messaging medium. Surveying broadly across iPhone & Android users, overall, the news is good. People like PUSH, and very few of them (10%) have a ‘block all’ mentality where they refuse any PUSH messaging to occur. data consumption, lack of ability to control the messaging and cost. 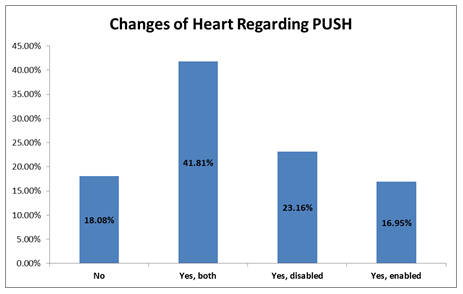 The broad majority of people not only allow PUSH, but they are actually ok with moderate to high frequency of the messages. Nearly 45% of those surveyed said that 2 to 3 messages a week were ok, with another 40% reporting that even 4 or more was just fine. This notwithstanding, there is clearly a cap to how many messages are too many. What exactly that cap is, however, is a moving target, fluctuating broadly between the type of message, the reason for the message and the type of app sending it. Spamming a consumer with product info, for example, will be far less tolerated than a message related to a game or social app. In other words, the purpose and context behind the message dramatically impacts the level of tolerance of the receiver. But it begs the question, when that line is crossed, when you’ve simply sent a consumer too many messages, then what? With email, you’ll get blocked or tossed into junk mail. With television, you’ll get skipped over, direct mail – trash can. In mobile it’s a little unnerving to realize; far worse might happen as backlash for PUSH spam. The penalties for crossing the boundaries of ‘just enough’ and ‘too much’ can be severe. When apps send PUSH messages too frequently, over 40% of consumers will disable the apps ability to send them, 13% will delete the app entirely, but a whopping 40% will do something to a brand I personally believe to be a fate far worse than ‘death’, they’ll ignore the brand message altogether, perhaps indefinitely. Think about it. It’s the mobile app equivalent of being put on hold – indefinitely. Your attempts to rekindle or cultivate the consumer relationship are futile because they haven’t removed you, they’ve just screened you out, leaving you unable to act. In the end, I think this is worse, because if you know you don’t have a dialog with a consumer, you simply endeavor & take the steps to establish one. If you have, however, no idea that your dialog is simply being disregarded, well, you’re maybe falsely raising the flag of triumph for consumer conversations you aren’t actually having yet, so you won’t make the effort to establish a conversation with them – you’ll think it already exists. 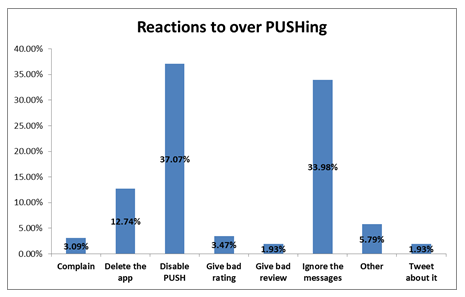 Worse still are the minority, but still very serious phenomena of those consumers who will badly rate or review an app they feel is going overboard with PUSH. Of those, at least some say they’ll use a social channel such as Facebook or Twitter to gripe and the results of that could range from minor to catastrophic, depending on how many people are listening on the complaining consumers channel(s). 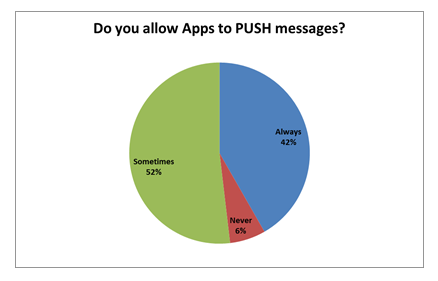 We also found out that less than 20% of those we surveyed claimed that opening or closing the PUSH door on an app was a one way street that they would never reconsider. 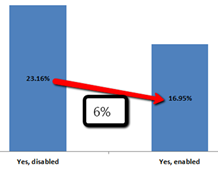 We asked our panelists if they had ever gone back and changed the PUSH settings of an app after the fact, and 40% of those who responded said that they had both enabled PUSH in an app where they’d previously refused it, and disabled PUSH in an app where they had once allowed the messages to come through. So the door on PUSH can swing both ways. Gain the trust of a consumer and even if they have previously said ‘no’ to your messaging, if they get the sense that there is value, they’ll turn it on. Cross ‘the line’, whatever that might be, with them and they are just as apt to turn it off. In fact, the data suggests that by a slim margin, about 6%,they are more apt to turn it off than on. 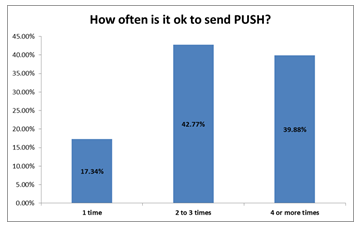 As obvious as it might seem to some, one thing is clear about PUSH. You have to earn right to PUSH to consumers, and for those who allow you to use this intimate and direct channel, value momentum must exist to keep that right. When asked what it is about a PUSH message that makes it worthwhile to a consumer to receive, value propositions are the ruling party. Of those, the majority claimed that coupon type offers would be enough of a driver for them to allow an app to message them, however just making mention of sales or promotions alone didn’t seem to be enough of an enticement to warm them up to the idea. A few things are becoming increasingly clear. PUSH is, essentially, a one way dialog, but it doesn’t have to be. Sure, you PUSH the message and it shows up with no real idea if the consumer saw it, but there are plenty of ways to tie that message to a response mechanism that can close the loop on the medium, establishing a clear lock on the number of folks who ‘did something’ in response to your push. This is essential in measuring not only the success of a brands efforts that utilize PUSH, but also instrumental in helping define the limits that consumers are willing to endure. With the data we’re seeing, it’s apparent that measuring the impact of PUSH is critical to not only measuring success, but also avoiding potential negative impact on the brand. It’s also very clear that PUSH, while a powerful tool at keeping an open dialog to your consumers, simply must have some intrinsic value behind the message, one that trades well for the attention the consumer is granting you. Ultimately, respecting the fact that the keyword here is ‘granting’ is probably the central insight to take away. The mobile PUSH channel is a direct link to the consumer to be sure, but it is also their channel, under their control. Consumer’s seem fairly forgiving in opening up the channel when the right value proposition is in place, but clearly, the data also shows that they will slam that door shut if they don’t like the knock. Why won’t TV advertising just die already?